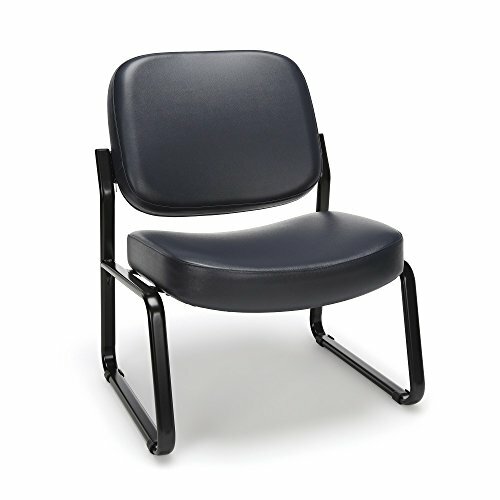 Whether furnishing a waiting room, an office, or any other high-traffic area, OFM’s Guest and Reception Chair Without Arms Model 405-VAM will provide a sense of classic uniqueness to any space. 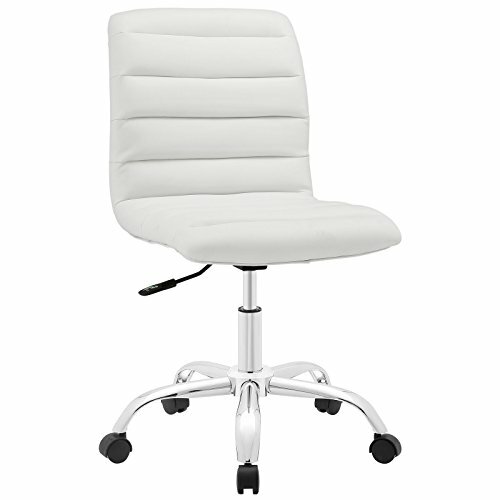 This chair includes a thickly padded 2.5" back and 3" seat that will cushion you during the time you spend in it. Virtually maintenance free, the vinyl covering is stain-resistant, anti-microbial, and anti-bacterial to keep you office space germ free. Enhance variety in your space with five appealing color choices. The 17-gauge sturdy steel tube sled base with arms is easy to assemble and has a weight capacity up to 250lbs. 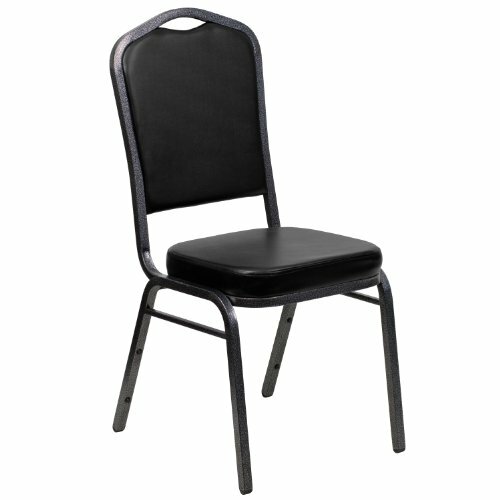 This commercial grade banquet chair with crown back design fits well in formal and casual settings from wedding ceremonies to corporate meetings and awards banquets.The chair's cushioned back and 2.5 inch thick seat are padded with CA117 fire retardant foam and covered with durable vinyl upholstery. Its sturdy, 16 gauge steel, powder coated frame, with gracefully angled legs, has been tested to hold up to 500 pounds. Double support braces reinforce the frame to give it great strength and durability. 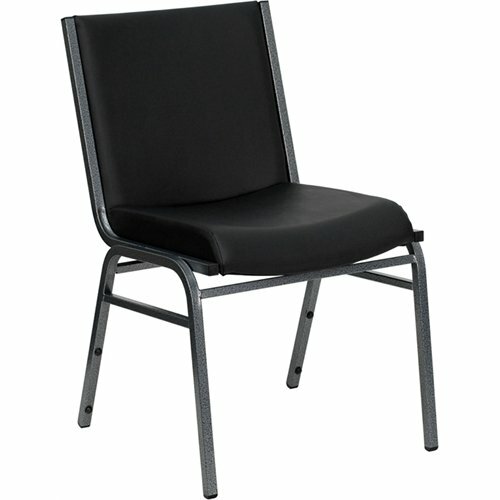 Bumper guards prevent scratches on the frame when stacked (up to 15 high) and non-marring floor glides protect your floor by sliding smoothly when you need to move the chair.This durable Banquet Chair is an excellent option for churches, banquet halls, training rooms, hotels, convention centers and schools. 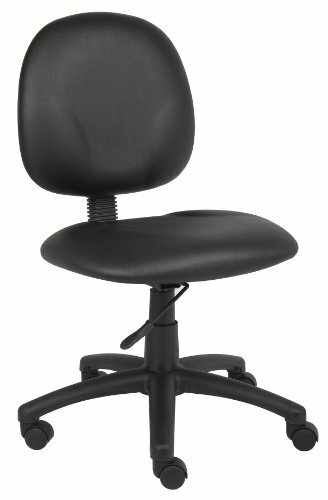 Keep things simple with the Boss Diamond Task Chair In Black Caressoft by Boss Office Products. 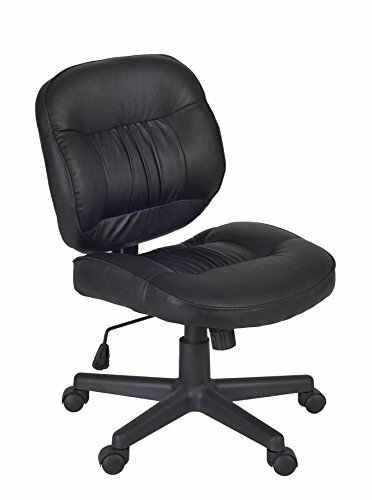 This sleek mid back ergonomic chair is expertly designed with a contoured back to provide proper support and comfort while working at home or in the office. Users will find it is a cinch to adjust the height using the pneumatic gas lift. Full measurements for this unit are 19.5" W x 25" D x 32-40" H with a weight of 28 pounds and a capacity for 250 pounds. The extra large seat and back cushions are welcome features, as is the easy to clean vinyl upholstery. 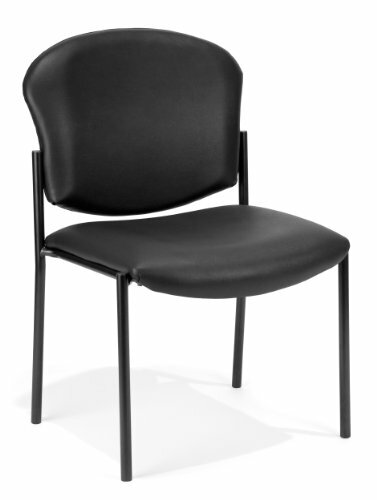 Whether furnishing a waiting room, an office, or any other high-traffic area, OFM’s Big & Tall Armless Guest and Reception Chair Model 409-VAM will provide a sense of classic uniqueness to any space. This stylish chair features an extra-thick, 4.75" thick upholstered seat and a 4.25" thick, upholstered, padded back cushion. The sturdy 1.5" oval tube frame stands up to demand. Choose from a variety of attractive anti-microbial/anti-bacterial vinyl's that help keep your work environment germ free. Padded arms add support and ease when entering and exiting the chair. Weight capacity up to 400 lbs. Cirrus is perfect for any task-oriented office layout or home office. Its compact, armless design allows the seat to slide completely underneath desks when not in use. 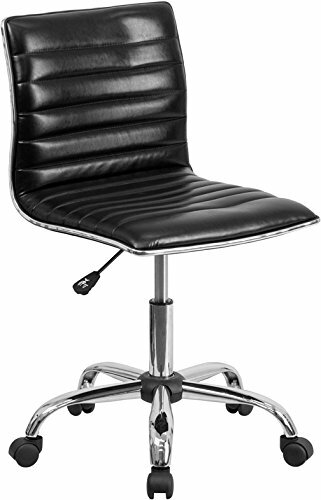 Its plush vinyl seat and back are finished with bunched seam stitching and is available in a choice of black or white to fit any style. An optional stool kit can raise the height of the Cirrus up to 9 inches, making it suitable for drafting or bar-height tables. 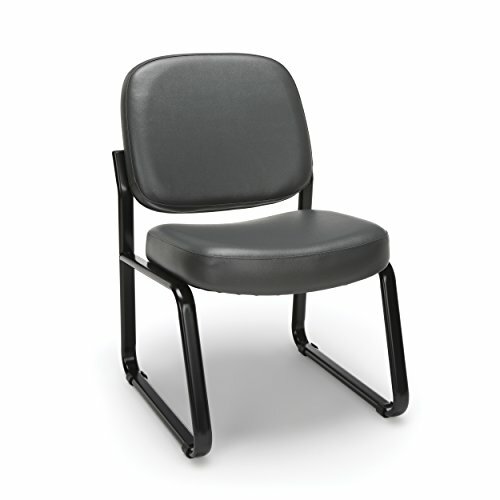 Chair functions include pneumatic seat height and tilt adjustments. 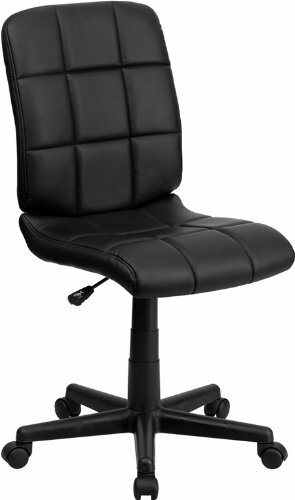 Explanation of functions- 360 degree swivel: Chair is able to rotate 360 degrees in either direction. Seat height: Chair's seat can raise and lower allowing the user's feet to remain flat on the floor. Center Tilt: Central pivot point allows the user to recline seat and back of chair at a fixed angle. Tilt tension: Allows user to adjust the amount of force that it takes to adjust the seat back angle. Tilt Lock: Locks the chair's back angle and inhibits it from being repositioned. All Regency chairs are backed by a 5-year limited manufacturer's warranty on chair bases and frames and a 2-year limited manufacturer's warranty on chair mechanisms and upholstery. Looking for more Armless Vinyl similar ideas? Try to explore these searches: Multimedia Speaker Pack, Little Coffee Book, and Italian Gourmet Food. Shopwion.com is the smartest way for comparison shopping: compare prices from most trusted leading online stores for best Armless Vinyl, Daron Worldwide Trading Wings Vehicle, Red Skeleton, Vinyl Armless . Don't miss this Armless Vinyl today, April 20, 2019 deals, updated daily.